Being one of the most complete and inclusive video converter available today, Wondershare Video Converter Ultimate has received a lot of attention lately, but is it really as good a video toolbox as it claims to be? We tried it out and found that it is one of those rare instances where everything they said about the video converter was actually true. The most basic functions expected of a video converter is of course, changing the format and Wondershare Video Converter delivers on that. Have you ever wondered how to convert MP4 to MP3? Well, Wondershare can do that for you in minutes or even seconds. The same applies for MP4 to WAV conversion, MXF to MP4 conversion, MOV to MP4 conversion and just about every other video format conversion you can think of because the Wondershare video toolbox supports more than 1,000 conversion formats. This includes all the 4K video formats, as well as some of the VR video formats as well. After the conversion to the required format, the videos ran flawlessly run on all Apple devices (iPad, iPod, iPhone, Apple TV), Android devices, Xbox One, Sony PSP and even some of the VR headsets. There’s support for a much wider range of devices as well, but you will have to visit their official site for the detailed info on that. What was most impressive about the Wondershare Video Converter Ultimate is the speed it offers because it’s blazing fast, especially when compared to other converters in the market. True to their promise of providing a 30x faster conversion rate, the speed really is impressive with huge videos being converted in a matter of minutes. Wondershare achieves this by combining its propriety APEXTRANS technology with the computer’s own GPU and CPU prowess. It would help if you have a powerful PC with a decent graphics card and processor, but the conversion rate will be a lot faster than others on any computer. To top it all off, Wondershare allows the conversion of multiple videos at once and in different format. Batch conversions in different formats, coupled with the speed we just discussed, puts Wondershare miles ahead of the competition. Aside from the conversion, the video converter can also burn your videos directly onto a DVD or a Blu-ray disc in any format of your choice. Of course, you can also do the same from a traditional ISO image as well if you need to and the process is surprisingly faster than on any other DVD burner software we have used so far. Wondershare Video Converter Ultimate allows the user to download any video from over 10,000 video-hosting websites, which include the obvious names of YouTube and Dailymotion. But irrespective of whether the video was downloaded from a website, shot from your camera or sent to you by someone, the video converter lets you edit it as much as you need to with its inbuilt video editor. There’s just so much more included in this video toolbox like a screen recorder, a GIF maker, a metadata editor for the videos and even TV casting options. 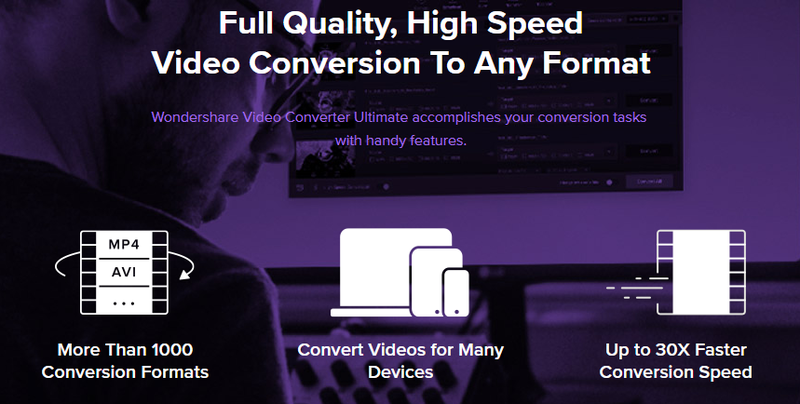 It’s hard not to recommend this product to anyone looking for a comprehensive, one-stop solution to all his/her video conversion/making/editing needs, especially since it’s possible to Try Wondershare Video Converter Ultimate for free! 1000fps Video Capture on the Galaxy S8?